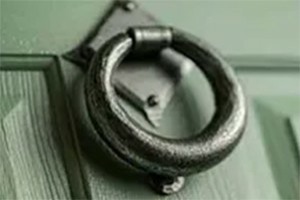 Front Doors Prices | How Much Do Front Doors Cost? What are the different types of front door and how much do they cost? Whether you are looking for new or replacement external front doors, it is useful to understand the various types of residential front door available in the market. If you have a good understanding of their features, prices and cost of installation it can help you narrow down which would be the most suited to your needs. Here we look at several types of front doors and their different features. A good appearance – how the door looks can create a good or bad impression. Strong & durable – your door should last a long time. Secure – your door should be able to withstand forced entry. Weather proof – it should keep out the elements. Energy efficient – so that you don’t lose heat. Most modern front door designs can offer all of these features, but some may do it better than others. So let’s compare timber, uPVC, composite and aluminium front doors against these criteria to see which offers the best combination. How the front door looks is one of the things that most folks will notice first (all the other features are not really visible) so, unless you are having a bespoke model built. You will probably find that the “average” front door will fall into one of the following styles. Timber is still quite a popular choice of material, owing to the “authentic look”. Softwood products have a reputation for high maintenance needs. Hardwood front doors have a longer life span and are less troublesome. The main advantage of using timber is that you can alter the look whenever you want to by applying new paint or staining. The disadvantages of using timber is that it can warp over time and need regular maintenance and painting. 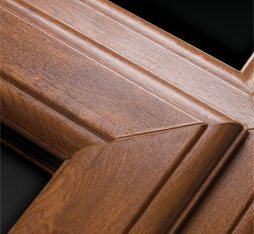 However, once you get into the “high-end” of designer timber doors, there are some fantastic designs in hardwood. Be prepared with a hefty budget, these doors are not your average front door and come with a relatively high price tag. uPVC front doors are made from engineered plastic. Their popularity is due to their lower maintenance routine and higher weathering resistance compared to wooden doors. They feature 3 or 5 lever & multi-point locks for security and also have reinforced panels and frames. They do not require painting and their only maintenance routine is regular cleaning. You can get uPVC in around 20 or so colours and coloured timber-grain surfaces. Low quality versions, however, can look cheap & plastic. Composite front doors are made from a combination of various materials which include glass reinforced plastic (GRP), insulating foam, wood and PVC. The final product is secure and strong making them some of the most desirable front doors in the market. 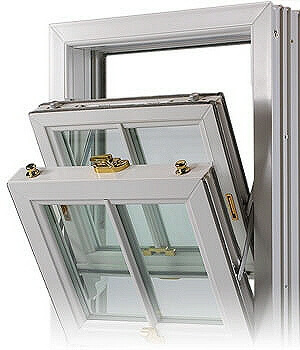 The fact that they combine both PVC and wood makes them advantageous over uPVC and wooden doors. 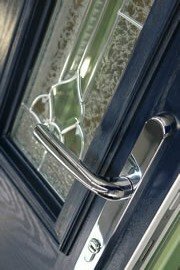 Top of the range composite front doors can have higher thermal and weathering resistance compared to uPVC and wood. The only maintenance need is wiping when they get dirty. Coloured composite front doors are available, with a good selection of single or bicolour designs (1 colour outside, another colour inside). The timber-grain versions are indistinguishable from wood without looking very closely indeed. These designs can be all aluminium or aluminium clad. 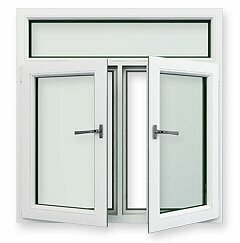 Aluminium clad doors can use Upvc or timber. Full specification aluminium doors can be amazing visually, with designers pulling out all the stops to create some very striking designs. 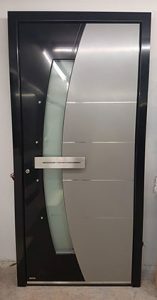 But the price range can get up to £1,500 to £2,000 for a bespoke aluminium front door. Aluminium clad timber & uPVC doors are what could be termed the “popular” installation choice and combine the best properties of both materials. Strong, energy efficient, great looking and durable. Front door prices depend on the type of door that you choose. uPVC doors are the cost effective, while some types of timber doors are quite cheap but need a lot of looking after. Composite and aluminium doors are superbly engineered but occupy a higher price bracket. The cost of a new front door also varies depending on the quality of the material used. Some materials are of higher quality than others and this reflects on the final cost. Other factors that influence the cost of installation are the door frame, door material, door type, installation company and your region. At the end of the day, personal preference and budget may well be the main determining factors of your choice of door. However, modern front doors are all designed to maximise security, appearance and energy efficiency. So as long as you get the best combination of these features for your money, then you have made the best decision for your circumstances.